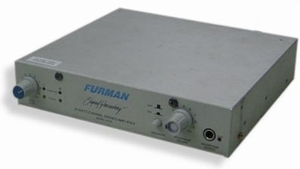 The SP-20AB Stereo Power Amplifier is a unique and economical 20 watt per channel stereo amplifier provided the load is 8 ohms (not recommended to use less than 8 ohms in stereo mode). Its toroidal transformer delivers ultra-quiet performance, making it ideal for recording studio applications. The SP-20A may be operated in any of three modes as selected by a rear-panel switch: normal stereo, two channel mono, or single channel (bridged) mono. The latter mode allows a power output of 30 watts provided the load is 16 ohms (not recommended to use less than 16 ohms in bridged mode). The SP-20AB is housed in a compact, half rack chassis, allowing it to be mounted either alone or side by side with other SP-20AB's in a 19" rack. Mounting kits are available from Furman. The SP-20AB's small size makes it ideal for modular use in large commercial installations with multiple small speakers. Its power capacity is also just right for driving the small 'cube' reference speakers used in most recording studios as a comparison with the main control room monitors - it can power them without overpowering them. The SP-20AB's output is available through either of two connectors: standard banana jack binding posts for speakers, or through a male XLR connector. The latter allows the unit to become a headphone driver, linking any number of Furman HR-2 Headphone Remote Stations together via standard microphone cables. Each HR-2 station conveniently clips to a mic stand and provides individual volume controls for two sets of headphones. When used for overdubbing or rehearsal, this setup provides plenty of loudness in any kind of headphones (even older lowimpedance models), and allows each musician to set his or her own comfortable volume level. When the overdubbing is complete and the musicians remove their headphones, the SP-20AB can also power the tape playback speakers through the banana jacks. The output - headphone chain or speakers - is selected by pressing a front panel pushbutton. An additional headset may be plugged directly into the SP-20AB's front panel. A volume control is provided for it. The SP-20AB has a convenient input level control on the left side of the front panel. A pair of yellow LED's � one for each channel � light up whenever signal is present (threshold -28 dBu). Another pair of red LED's show an overload condition in either channel. The SP-20AB is fully protected against thermal overload, and it can withstand a short circuit on any or all outputs for an indefinite time without damage.